Clay Conley says love, luck and loyalty are the keys to his success as chef of Palm Beach’s much loved — and critically acclaimed — būccan and Imoto restaurants on Palm Beach. With the Palm Beach Food & Wine Festival kicking off Dec. 10 with a First Bite night at būccan, we talked with the chef about his mentors, Maine roots and final meals. C&S: Your latest restaurant, Grato, will open this month in West Palm Beach. Having three restaurants now, all with different concepts, what is the thread that makes them all yours? CC: I think we approach them all the same way. I like big, bold, lusty flavors that are well balanced. I love acidic counterpoints to big rich flavors. C&S: What was the biggest influence on your career? CC: [Celebrity chef and restaurateur] Todd English. Still maybe one of the best cooks I’ve ever seen. More importantly, a really good guy. 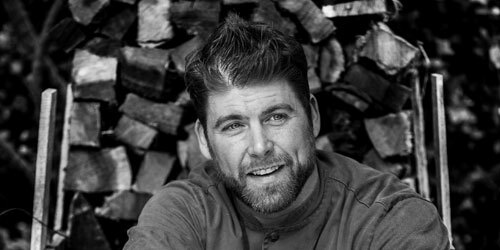 C&S: Why the passion for cooking with wood? CC: The house [where] I grew up in Maine was a colonial built in the 1700s. It was heated entirely by wood stoves and fireplaces, which means that much of my fall season was spent cutting and stacking wood. I learned at an early age respect for this energy source, and every time I cook with it I feel a little nostalgic. C&S: How do you feel about so many chefs doing books and endorsing products, and do you have plans for that in the future? CC: I don’t really have any plans to write a cookbook, there are so many better cooks out there and there are a million cookbooks already. If I was to ever write anything it would have to be something very personal to me. C&S: What would you eat for your last supper? CC: My Grandma Millie’s pork sauerkraut and dumplings. The 9th Annual Palm Beach Food & Wine Festival, Dec. 10-13 in multiple locations. Tickets and information, pbfoodwinefest.com, or call 561-389-1222. At press time, the First Bite event at būccan had sold out – but tickets to other events remain.